You will be getting a lot of stick in the Grays Nano 5 and will help you to continue to play great field hockey at a reasonable price! My first review of the Grays Nano range of hockey sticks starts with the Nano 5. I for on appreciate the change from Grays to simplify their range, it was/is so big and use of numbers and digits rather than names makes it very difficult to know what you are buying. Grays Nano 5 is my first of many reviews of this range of hockey sticks for a number of reasons, not least that I like a bit of value for money. What do I mean by value for money, well you get a lot of stick for less of a price. First lets nail the name. Nano Technology is now pretty standard across most hockey stick brands, not to devalue Grays part in developing it in anyway. We know that Grays are the longest established and a highly regarded hockey stick brand. Nano technology is part of the manufacturing process of hockey sticks. You can go to town on understanding exactly how it works, or you can understand that when you make a hockey stick the hollow inside and the fibrous outer material needs to be filled with something to hold it all together. Traditionally a resin has been used to do this. Within Grays Nano 5 hockey stick a special resin than is made to include tiny carbon strands gets used to do this job. The point in having tiny carbon strands in the resin is to make it all a bit tougher. Sounds simple, is complex, makes the hockey stick better and that’s what we really need to know. How better? Well the Nano 5 from Grays hit’s the ball hard, really hard for a stick with this mix of materials. How much of a mix we don’t know for sure as the one frustrating thing about the Nano range is Grays aren’t going to tell us anymore the exact composition but encouragingly there is no mention of fibreglass so we guess by this description and the fact the ball absolutely flies when you catch it hard leads us to believe its very high. 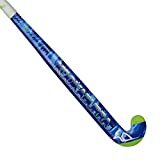 Previously I have commented on hockey stick brands use of material on the head of the stick that is designed to grip the ball, to bring it under control quicker when receiving and make dribbling a little easier. Grays actually seem to have nailed this too, described in marketing speak as IFA “Improved Feel Area” it is noticeably tacky on the face of the Grays Maxi head. As well as providing grip, IFA dampens the impact of the ball on the head which is particularly nice when receiving the ball and all adds to the Grays Nano 5 softer feel than higher end carbon only sticks. Another thing to review about the Nano 5 is the classic Grays Maxi head, which in my opinion is one of the best out there. It is thin enough to get under the ball for 3D stuff and solid enough for you to feel comfortable giving it a good smack. Last thing about the setup of the Grays Nano 5 before I tell you why its value for money is to mention the weight of the stick. It’s heavy ok, it feels more sledge hammer than feather duster. Personally I like to feel my stick in my hands and if I need to move it quickly to make a tackle, I just don’t bother. I know many people like a lighter stick these days, I can understand that. Great news is the Grays Nano 5 comes in light and medium. The light 37.5” is well on the top end of the light spectrum at about 575g. If you are specifically looking for a light stick you might want to look at something else, Mercian are really light hard hitting sticks. Value for money I mentioned right at the beginning and this is where I think you could be on to a winner with the 2014/15 Grays Nano 5. This stick is cheap for what you get. Grays are going all out to make the Nano range accepted by the market and combining the high carbon content, the IFA, the Maxi head, the soft feel handle, you get many of the top of the range features in a stick which is available online nice and cheap. This is up there as one of my star buys for how much you get for how little you spend. Don’t go without knowing the Mid-Bow shaft bow profile from Grays is a dream. 25mm at 300mm up from the floor this shape of shaft bow is fantastic for players that can’t get on with the extreme kink in many low bow shafts these days. The 2014/15 Grays Nano 5 is the awesome looking black one with the cool hexagons on it, it looks even better in real life.